Ciaran is a native of Ireland and began coaching his first youth team (Carnlough Swifts U12B) at the age of 16. He has continued coaching on a volunteer or professional basis ever since. As a player Ciaran represented both his county and his country at youth level as a central defender and combative midfielder. Ciaran studied Sports Coaching and Development for 2 years, earning a BTEC National Diploma in Sport from Northeastern Institute in Co. Antrim. As a student of the University of Abertay, Dundee, Scotland, he studied Sports Coaching and played both collegiate soccer and gaelic football. After 4 years in Scotland, Ciaran moved to Austin to join Lonestar Soccer Club in 2009. Ciaran became a UEFA certified Coach in 2003 and is currently climbing the USSF ladder with the ambition of becoming a USSF A-license Coach. In his 5 years with the club, Ciaran has coached many teams to many successes in Directors, Presidents and National Cup. Ciaran also works as the assistant coach for the Soccer Academy at St. Stephen’s, with many of his former players now playing soccer at some of the finest athletic and academic institutions in the country. 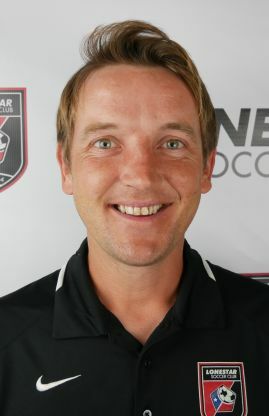 Ciaran is currently the Assistant Director of Coaching for the SCL/Division 1 Girls Program.